Wool, where does it come from? Yes, you know, sheep, but do you know there are different types of wool used for different purposes. At Ross Farm we have two different types of sheep with completely different fleeces. Come, let us show you. 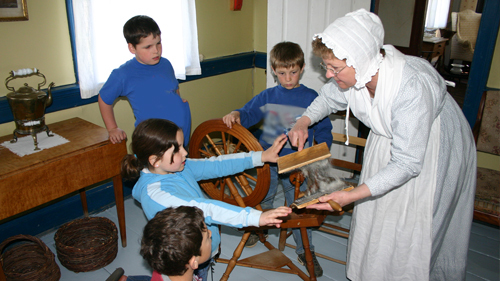 Our interpreters will explain to the hands-on group the importance of wool to the early settlers and its many uses, starting from the raw fibre, just off the sheep to a finished product. There are many steps in processing wool and it is no easy task. First the wool must be washed of its lanolin and dirt. This task can be time consuming and is meant for warm summer days, so the wool that the children work with has been already per-washed. There is still however, more dirt in it that needs to be removed. This is where students have the opportunity to pick the wool apart to remove the remaining dirt. While doing this the remaining lanolin in the wool softens their hands as they experience the texture of wool before being processed. Next, carding the wool is needed; by using hand cards the fibres can be straighten. This process is more difficult then you may think, but it is needed before spinning can take place. By straightening the fibres the wool can be made into rolls. This allows the wool to be fed into the spinning wheel. Students can complete this task by using the skilled direction from an interpreter. Spinning is the final step in wool processing; each participant can try their hand at spinning, completing the process of wool into yarn.